A dry, sunny day when 2 of my quilt holders were home. Yay! Time to drag out some recent finishes and take some pictures. First up is a sweet little quilt top I finished today. This little string quilt has been in the works for a while, Every once in a while when the strings called, I pulled out the pastel ones and made a few blocks. They called again today. When I realized I just needed 2 more blocks to make a decent sized little quilt, I decided to finish it up. I had just enough of this little rose fabric to border it. With the border the quilt measures 45 x 57. So soft and sweet. I have been working on this one with the intention of donating it to our local foster care system. It will be a tough one to give away. I will just have to picture some sweet little girl hugging it tight. Scrappy quilts really are the best! Next up is my scrappy purple tulip quilt. I used all the purples. Every shade. If it was purple, it went in. And the background fabrics are scrappy too, lots of different low volume prints playing together in there. The pattern is a free Cloud 9 pattern found on their website. It is called the Amsterdam Quilt. I can definitely see myself making this one again, the blocks go together easily and are a great use of scraps. Next up is my scrappy bear paw quilt. It just needed that final border and I got that on this morning. 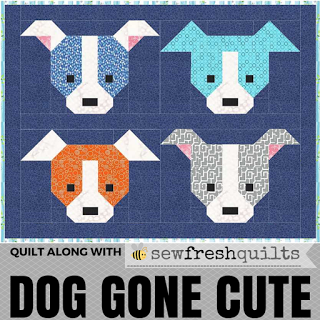 This is such a bright fun scrappy quilt. Anything went with these scraps as long as they were bright and colorful. I used a brown background which is a new thing for me, but I really like it. It allows the scraps to just pop. This one is pretty big at about 92x94. I really, really like scraps. Can you tell? And finally, a real finish. I just got my Star BOTM back from being quilted by Cyndi at The Dancing Bobbin. Since all of the colors I used were based on the amazing butterfly fabric featured in a couple of the stars as well as the backing fabric, I thought it only appropriate that it be quilted with butterflies. And I just LOVE it! Thank you Cyndi! I mean seriously, is this fabric not AMAZING!!! I just love it. And yes, I did save every single tiny piece that was trimmed off. It will find its way into many more scrap quilts. Thanks for stopping by for some show and tell!! Great quilts. I especially love the tulip quilt and your Star BOTM quilt. Truly beautiful quilts, I love the bear paw quilt and what a great choice of background fabric. The butterflies are special also. Love love both the tulips and bearpaws! Scrap quilts are magical, aren't they? Thanks for sharing your beautiful creations. Such beautiful quilts! Amsterdam Quilt - a perfect name for the tulip quilt. I love purple flowers. Amazing quilts here. beautiful fabrics, color and pattern. awesome work. There is so much eye candy in just one post. Love the butterfly quilting with the butterfly fabric!!! The Tulips quilt is very impressive. But the two pairs of shoes peeping from behind made me smile. I also wanted to thank you for your sweet comment on my Strawberry + Peptobismol quilt. awesome blanket. looks so gorgeous.